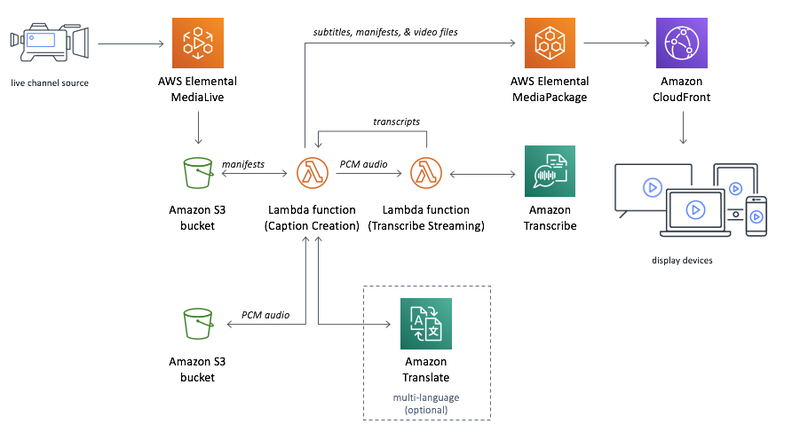 The solution deploys Live Streaming on AWS which includes AWS Elemental MediaLive, MediaPackage, Amazon CloudFront. The solution also deploys AWS Lambda, Amazon Simple Storage Service, Amazon Transcribe, and Amazon Translate. This entry was posted in AWS, Cloud, Computer, Murmuring, Network, Recreation, Service and tagged amazon, aws, cloud, cloudfront, elemental, lambda, language, live, medialive, mediapackage, multi, s3, service, stream, subtitle, transcribe, translate on March 22, 2019 by Gea-Suan Lin. Logpush currently works with Amazon S3 and Google Cloud Storage, two of the most popular cloud storage providers. This entry was posted in AWS, CDN, Cloud, Computer, GCP, Murmuring, Network, Service and tagged access, amazon, cdn, cloud, cloudflare, enterprise, google, http, https, log, logpush, s3, service, storage on February 27, 2019 by Gea-Suan Lin. It is designed for customers — particularly those in highly-regulated industries, such as the Financial Services, Healthcare, and Public Sectors — that retain data sets for 7-10 years or longer to meet regulatory compliance requirements. This entry was posted in AWS, Cloud, Computer, Murmuring, Network, Service and tagged amazon, archive, aws, cloud, data, deep, glacier, log, long, retention, s3, service, storage, term on November 29, 2018 by Gea-Suan Lin. You can migrate workloads from existing write-once-read-many (WORM) systems into Amazon S3, and configure S3 Object Lock at the object- and bucket-levels to prevent object version deletions prior to pre-defined Retain Until Dates or Legal Hold Dates. S3 Object Lock can be configured in one of two modes. When deployed in Governance mode, AWS accounts with specific IAM permissions are able to remove object locks from objects. If you require stronger immutability to comply with regulations, you can use Compliance Mode. In Compliance Mode, the protection cannot be removed by any user, including the root account. This entry was posted in AWS, Cloud, Computer, Murmuring, Network, Security, Service and tagged amazon, aws, cloud, compliance, governance, lock, mode, object, permission, s3, security, service, storage on November 27, 2018 by Gea-Suan Lin. S3 Intelligent-Tiering stores objects in two access tiers: one tier that is optimized for frequent access and another lower-cost tier that is optimized for infrequent access. For a small monthly monitoring and automation fee per object, S3 Intelligent-Tiering monitors access patterns and moves objects that have not been accessed for 30 consecutive days to the infrequent access tier. There are no retrieval fees in S3 Intelligent-Tiering. If an object in the infrequent access tier is accessed later, it is automatically moved back to the frequent access tier. No additional tiering fees apply when objects are moved between access tiers within the S3 Intelligent-Tiering storage class. S3 Intelligent-Tiering has a minimum eligible object size of 128KB for auto-tiering. Smaller objects may be stored but will always be charged at the Frequent Access tier rates. S3 Intelligent-Tiering, S3 Standard-IA, and S3 One Zone-IA storage are charged for a minimum storage duration of 30 days. This entry was posted in AWS, Cloud, Computer, Murmuring, Network, Service and tagged amazon, aws, class, cloud, cost, intelligent, pricing, s3, saving, service, standard, storage, tiering on November 27, 2018 by Gea-Suan Lin. Q: Can I use fixed IP addresses to access the SFTP server endpoint? A: No. Fixed IP addresses that are usually used for firewall whitelisting purposes are currently not supported. Q: Which compliance programs does AWS SFTP support? A: AWS SFTP is PCI-DSS and GDPR compliant, and HIPAA eligible. AWS SFTP is available in AWS Regions worldwide including US East (N. Virginia, Ohio), US West (Oregon, N. California), Canada (Central), Europe (Ireland, Paris, Frankfurt, London), and Asia Pacific (Tokyo, Singapore, Sydney, Seoul). This entry was posted in AWS, Cloud, Computer, FTP, Murmuring, Network, Service and tagged amazon, aws, cloud, ftp, s3, security, service, sftp, storage on November 27, 2018 by Gea-Suan Lin. Today we are announcing that beginning immediately, Backblaze B2 customers will be able to download data stored in B2 to Cloudflare for zero transfer fees. This entry was posted in AWS, CDN, Cloud, Computer, Murmuring, Network, Service and tagged amazon, aws, backblaze, bandwidth, cache, cdn, cloud, cloudflare, cloudfront, cost, fee, hit, pricing, rate, s3, service on September 27, 2018 by Gea-Suan Lin. Effective September 1, 2018 we are reducing prices for data transfer from Amazon Elastic Compute Cloud (EC2), Amazon Simple Storage Service (S3), and Amazon CloudFront by up to 34% in Japan and 28% in Australia. This entry was posted in AWS, CDN, Cloud, Computer, Murmuring, Network and tagged amazon, aws, bandwidth, cdn, cloud, cloudfront, data, ec2, fee, japan, price, pricing, reduction, s3, service, tokyo, transfer on September 20, 2018 by Gea-Suan Lin. Today, Amazon S3 Select works on objects stored in CSV and JSON format. Based on customer feedback, we’re happy to announce S3 Select support for Apache Parquet format, JSON Arrays, and BZIP2 compression for CSV and JSON objects. We are also adding support for CloudWatch Metrics for S3 Select, which lets you monitor S3 Select usage for your applications. This entry was posted in AWS, Cloud, Computer, Murmuring, Network, Programming, Service and tagged amazon, aws, bzip2, cloud, compression, parquet, s3, select, service on September 8, 2018 by Gea-Suan Lin.